Sadie has had the time of her life playing with her Sing-a-Long Keyboard and her Cash Register from Baby Genius. The keyboard has many features including beat sounds, tempo control, 22 play along songs and 7 Baby Genius Sing-a-Long Songs. (oh and volume control…momma’s fav…) It is light enough for her to carry around and just the right size that she can bring it along in the car or we can pack it in her bag when we go visiting. The Cash register has been ringing up the sales too. We play shopping and I buy things and she rings them on. It comes with fake money and coins and a swipe card. She will be able to play store for years to come and make use of the actual key pad that adds things up for math teaching. We also got to watch one of the Baby Genius DVDs. 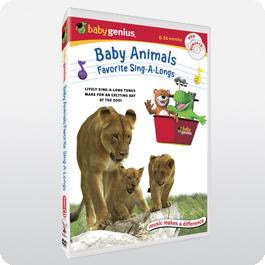 Baby Animals Favourite Sing-a-Longs is a lively DVD with sing-a-long tunes that the whole family can have fun with. Its has the Baby Genius Musical Characters along with the lyrics in both English and Spanish. The photos are real life creatures from the San Diego Zoo. Very fun to watch. Visit Baby Genius at www.babygenius.com for these and other products.